Louise S. Wimmer, 89, of Salem, peacefully passed away Saturday, September 22, 2018. She was born in Galax, a daughter of the late Henry H. and Carrie Horne Sawyers, and had been a Salem resident most of her life. 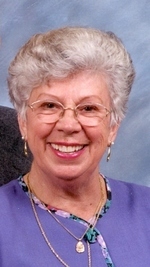 She was a longtime member of Salem First Christian Church, loved gardening, cooking and was a very caring and giving person. Most of all, Louise enjoyed spending time with her family and friends. In addition to her parents, she was preceded in death by her spouses, Fred Moore, James Tobey, and Howard Wimmer, and seven brothers, Ted, Bill, Talmadge, Lonnie, Homer, Bud and Floyd. She is survived by her loving children, Pam Meador and husband Bobbie, Karen Moore and husband Ernie Braganza, Keven Moore and wife Kathy; two brothers, Dr. Joe Sawyers and wife Lois, Loyd Sawyers and wife Ruth; five grandchildren and four great-grandchildren. The family would like to express their sincere thanks and appreciation to all of her caregivers over the last few years. Funeral services will be held at 11AM, Tuesday, September 25, 2018 at the First Christian Church, Salem. The Rev. Dan Netting will officiate. Burial will follow at Blue Ridge Memorial Gardens. The family will receive friends from 6 to 8 PM, Monday at John M. Oakey & Son Funeral Home, Salem. Memorial contributions in her memory may be made the First Christian Church 712 Front Ave. Salem, VA 24153. An online guest book is available for family and friends by visiting www.johnmoakey.com.